CBD oil has been making the news in a big way. Social and other media are talking of almost nothing else. It helps ease the pain of both joint and muscle pain as well as chronic pain. It’s all natural and has no side effects. What’s not to love? On the other hand, people with pain might be taking medications for other conditions such as heart, diabetic, and mental hygiene medications, among others. 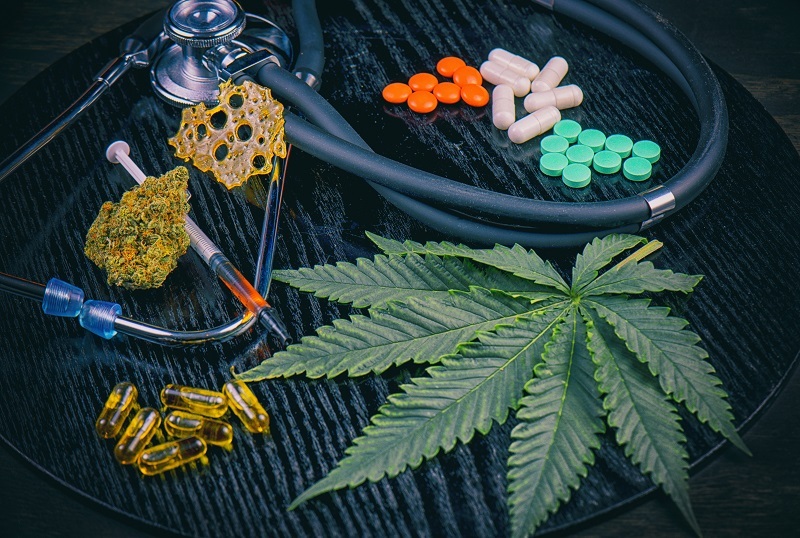 Does CBD oil react with other medications? If so, which ones? What can you expect if you mix the two? Before we get into CBD oil and its drug interactions, we need to first understand why there are interactions. When you take a medication, the first stop the medication makes is the liver. There, enzymes leap into action to protect the organ from harm from the chemicals. Now the cytochrome that processes CBD oil enters the picture. CBD is metabolized by CYP2C19. CBD is a major inhibitor of CYP3A4, which metabolizes one quarter of drugs and CYP2D6, which metabolizes antidepressants, opioids, and beta blockers. This means that when CBD hits the liver, it stops these drugs from doing their jobs to the fullest extent possible. What Happens During A Drug Interaction? In the first, two or more drugs have an effect on the patient. For example, if you take an allergy medication on top of taking sleeping medication, then one will make the other more effective. Don’t drive a car or use any kind of machinery if you do this. The second is when the active ingredients in foods, drinks, or herbal supplements react to a drug. Let’s say you take statins for heart problems. Don’t eat leafy greens, broccoli, Brussels sprouts, Vitamin K fortified cereals, or fish, meat, eggs, or liver. The Vitamin K will react badly with the statin. The third reaction occurs when a health condition battles a drug. For instance, if you take a cough preparation, you won’t want to take it with your blood pressure medications. Cough medications make blood pressure rise, so ask your doctor before taking an over the counter cold preparation. When a drug or nutrient enters the liver, the inactive compounds are separated and stored in the liver. The active compounds are then absorbed into the bloodstream. When CBD is metabolized, however, a major portion of it is passed through waste product, leaving very little CBD to enter the bloodstream. There’s still a major problem with CBD oil in the liver. When the CBD enters the liver, the enzyme that processes drugs, P450, won’t work temporarily. This makes the drugs (a) take longer to be absorbed into the bloodstream, (b) not as strong once it gets there, or (c) sometimes the CBD increases the drug’s effects on the body. Studies have shown that Clobozam is changed when it’s broken down in the liver. It could intensify the effects of the drug and its side effects. This drug could cause liver damage. Taking CBD with valproic acid elevates the chance of liver damage. Consult a doctor for dosages. The body breaks down and changes eslicarbazepine. CBD could lessen the time it takes for the body to break down or change the drug. A small amount of the drug could remain in the body. Most drugs are changed or broken down in the liver. CBD affects how quickly this happens. The effects of the drug as well as its side effects could increase. Consult your health care provider if you take any drugs before you combine them with CBD. Find out more. This drug is broken down in the body and changed. The time it takes to break down could be decreased by taking CBD. A small amount could remain in the body. Sedatives help people sleep and so does CBD. Combining the two causes too much sleep, because CBD oil decreases the time it takes the body to break down the sedatives. Thus, the sedative level in the body remains high. Consult your doctor before taking them together. This is broken down in the body and changed. CBD oil decreases the time it takes for the body to break it down and change it. A small amount will remain in the body. CBD has some wonderful properties. It’s all natural, has few to no side effects, and doesn’t cost an arm and a leg. It’s said CBD helps with fat metabolism and thus with weight loss. For chronic pain sufferers, it spells relief. CBD reacts with chemical medications, though. That’s serious business. Work with your doctor, and you could possibly reap the benefits of both CBD and your chemical medications.